Despite my ramblings and complaints about the $99 subscription needed to properly use Microsoft's office last week, I have come to enjoy using PowerPoint for iPad in the classroom. No, I have not paid the money to subscribe. In fact, I chose to actually delete Word and Excel as I don't see a need for them, and they were taking nearly 1GB of my iPad storage. If you want to just use the free version of the three apps, you don't have the ability to edit nor create files. However, for PowerPoint, the “read-only” feature is actually very useful in my teaching. 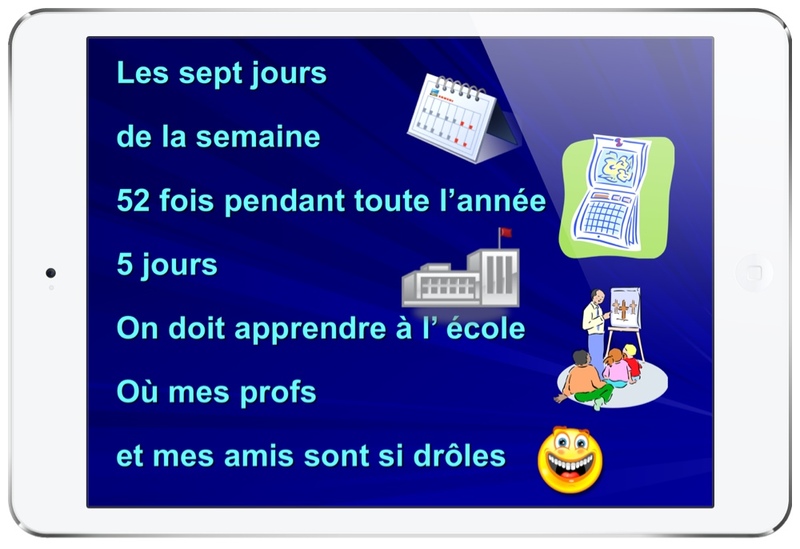 Since most people will have ready-made PowerPoints already created, they will be able to access and project them to their class using a projector. At this time, I don't feel the need to edit my PPT files on my iPad. Instead, just having the ability to present my presentations on the native PowerPoint app has been a superb addition to my iPad use in my class. I teach in several different classrooms throughout the week. Since each classroom has its own projector, I now only need to bring my iPad, an HDMI cord and adaptor, and I'm ready to go. All my PowerPoints are now at my fingertips. Before, I opened and edited my PowerPoints through iWork's Keynote, but the transitions and visual effects did not completely transfer between the two programs. Now, every single transition remains in tact when I use my iPad. Through Dropbox, I am able to open all my power points in Microsoft office PowerPoint using the “Open in…” feature. All the PowerPoints that I tried opened flawlessly. All this transitions are there, and all the slides work very smoothly. The slides look exactly like they would on my Mac, so this is an excellent option for you if you plan on projecting your power points without a laptop or desktop computer. I don't mind not be able to edit my PowerPoints, since they are more presentations that have already been completed. I suggest that if you have a lot of PowerPoints already created for your teaching, give PowerPoint for iPad a shot. 1. In your cloud storage app (Dropbox displayed below), find a PowerPoint to open. The file will actually open in Dropbox directly, but with zero transitions and effects. 2. 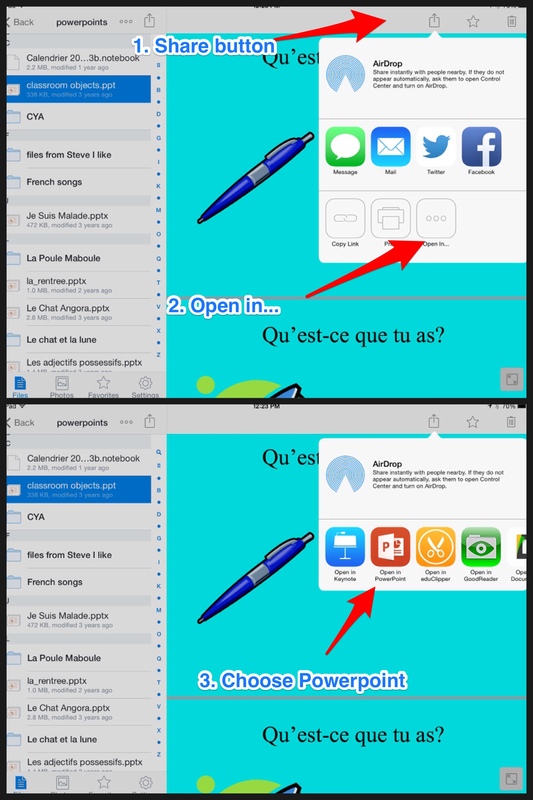 Now tap the Share button (this should be available in all cloud storage apps, and choose “Open In…” If you have already downloaded PowerPoint, it will be one of the choices. Tap it. Your PowerPoint will open within a few seconds. 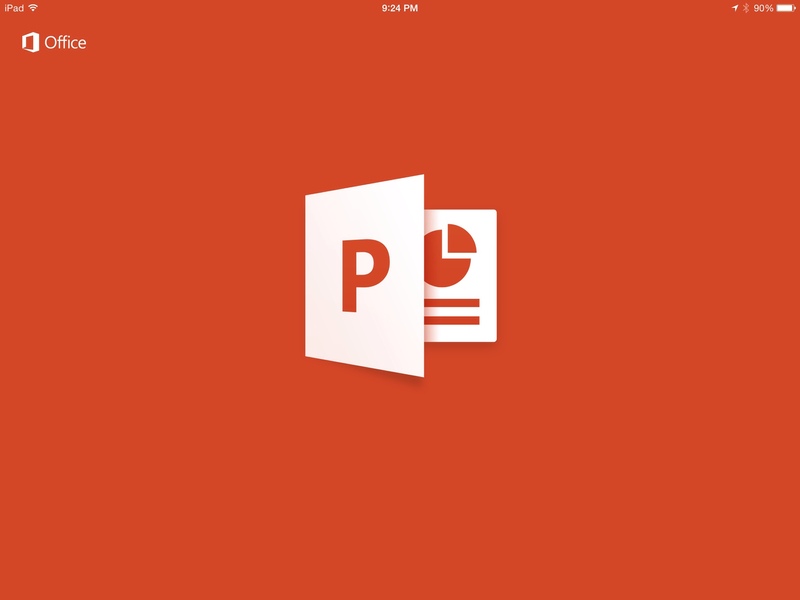 PowerPoint for iPad in Read-Only from Steve Lai on Vimeo. Annotations: A Great New Feature, even in Read-Only mode! In playing with various PowerPoints, I noticed that you can annotate your slides from your iPad. You can choose either a thinner pencil-width or thick highlighter style annotation. The annotations are not saved once you exit the slide show, however, if you wanted, you can quickly grab a screenshot of them. This may prove to be a very useful tool for teachers who like to perhaps explain their slides. The variety of colours is not huge, but it will do the trick nicely. To try this, open a PowerPoint and start your Slide Show. Now scroll your finger down from the top. You should receive this screen, on the top right, you will see a pen, pen settings, and a blank screen button. 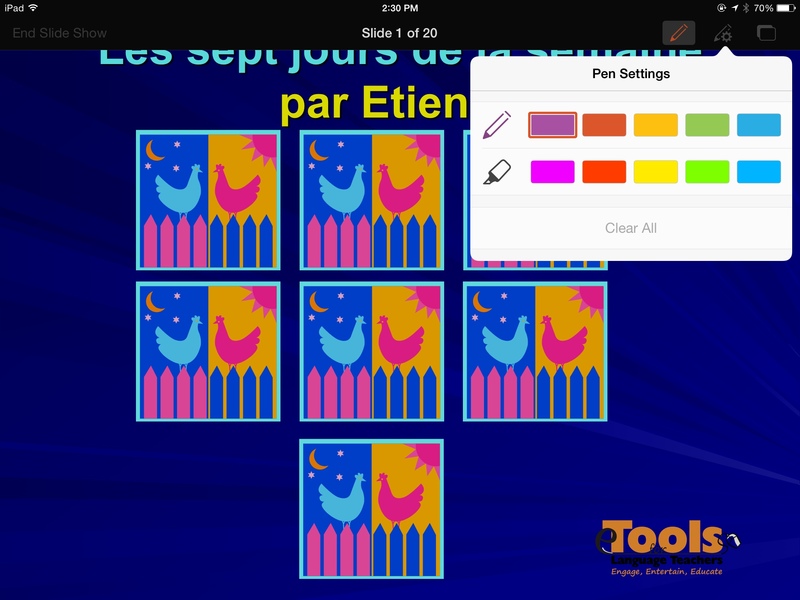 Choose your width and colour and you should be able to draw or write straight on the screen. While there is no eraser button, you can clear your notes within one tap. This might be useful when you want to point out specific areas of your slides, like on a map. Can you think of any real examples of how this feature will be beneficial for teachers? Please let us know in the comments! 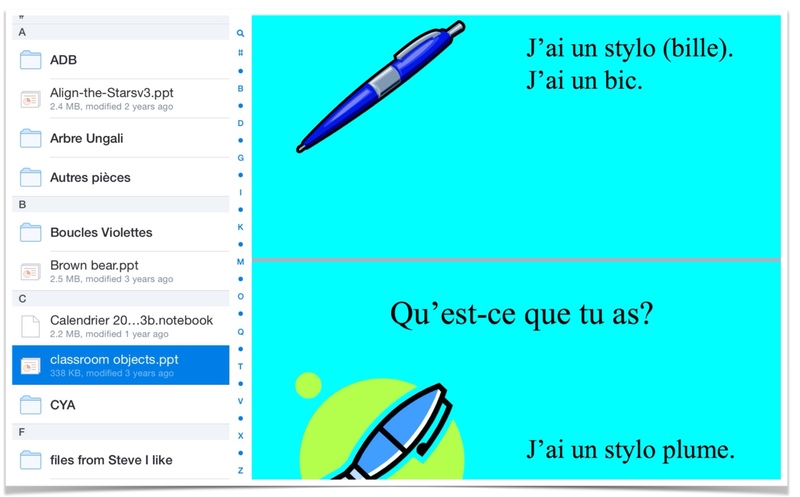 So, if you are an iPad teacher (which is probably why you are reading this), try this out. You may agree with me that the Read-Only feature for PowerPoint is actually quite useful in the classroom. Note: All PowerPoints in this blogpost created by my friend and colleague Sylvia Duckworth. If you are a language teacher, follow her on Twitter, and make sure you check out her profile here.